The Cargo Pocket Jacket by Boulder Creek is so versatile, you can wear it almost anywhere. roomy fit for a big guy 32" length in Big and 34" in Tall for complete coverage and warmth shirt style collar gives a classic look tagless label two-way zip front snap storm flap multiple cargo pockets on front and horizontal zip chest pockets bottom two pockets with dual entry additional pocket on left sleeve adjustable snap barrel cuffs locker loop close durable all-cotton construction machine wash; imported Men's Outerwear in Big Sizes XL, 2XL, 3XL, 4XL, 5XL, 6XL, 7XL, 8XL; Tall Sizes L, XL, 2XL, 3XL, 4XL, 5XL Read more: This multi-pocket jacket is rock solid quality made from durable cotton twill and it has a super convenient locker loop for easy hang! 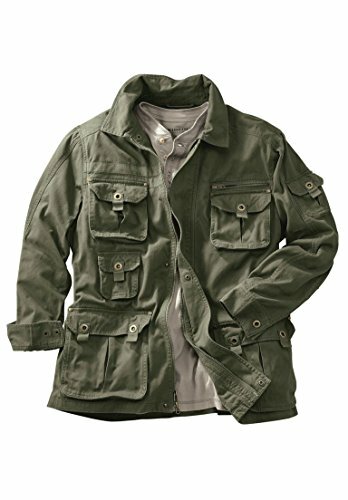 This cargo jacket has a great distinct look and feel to it and is perfect for chilly weather. Plenty of pockets for anything you want to store. Plus it comes in a variety of colors, depending on your personal style. Pair this jacket with loose fit jeans and a polo shirt and you are sure to have a look to impress. Go get 'em! Reasons to Buy: Customers love this jacket for being convenient and great for work with its tons of pockets. They also think it's made of quality material with a good wide cut that makes them feel comfy and relaxed. Durable jacket with plenty of room for comfort. If you have any questions about this product by Boulder Creek, contact us by completing and submitting the form below. If you are looking for a specif part number, please include it with your message.